"Cargo jet" redirects here. For the Canadian cargo airline, see Cargojet. A cargo aircraft (also known as freight aircraft, freighter, airlifter or cargo jet) is a fixed-wing aircraft that is designed or converted for the carriage of cargo rather than passengers. Such aircraft usually do not incorporate passenger amenities and generally feature one or more large doors for loading cargo. Freighters may be operated by civil passenger or cargo airlines, by private individuals or by the armed forces of individual countries (for the last see military transport aircraft). Aircraft designed for cargo flight usually have features that distinguish them from conventional passenger aircraft: a wide/tall fuselage cross-section, a high-wing to allow the cargo area to sit near the ground, a large number of wheels to allow it to land at unprepared locations, and a high-mounted tail to allow cargo to be driven directly into and off the aircraft. Cargo aircraft represent a small proportion of the overall air freight market. The majority is carried in special ULD containers in the cargo holds of normal passenger aircraft. In the UK during the early 1920s, the need was recognized for a freighter aircraft to transport troops and materiel quickly to pacify tribal revolts in the newly occupied territories of the Middle East. The Vickers Vernon, a development of the Vickers Vimy Commercial, entered service with the Royal Air Force as the first dedicated troop transport in 1921. In February 1923 this was put to use by the RAF's Iraq Command who flew nearly 500 Sikh troops from Kingarban to Kirkuk in the first ever strategic airlift of troops. Vickers Victorias played an important part in the Kabul Airlift of November 1928–February 1929, when they evacuated diplomatic staff and their dependents together with members of the Afghan royal family endangered by a civil war. The Victorians also helped to pioneer air routes for Imperial Airways' Handley Page HP.42 airliners. The World War II German design, the Arado Ar 232 was the first purpose built cargo aircraft. The Ar 232 was intended to supplant the earlier Junkers Ju 52 freighter conversions, but only a few were built. Most other forces used freighter versions of airliners in the cargo role as well, most notably the C-47 Skytrain version of the Douglas DC-3, which served with practically every Allied nation. One important innovation for future cargo aircraft design was introduced in 1939, with the fifth and sixth prototypes of the Junkers Ju 90 four-engined military transport aircraft, with the earliest known example of a rear loading ramp. This aircraft, like most of its era, used tail-dragger landing gear which caused the aircraft to have a decided rearward tilt when landed. 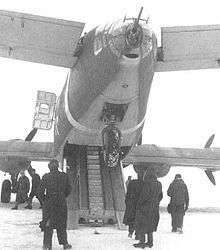 These aircraft introduced the Trapoklappe, a powerful ramp/hydraulic lift with a personnel stairway centered between the vehicle trackway ramps, that raised the rear of the aircraft into the air and allowed easy loading. A similar rear loading ramp even appeared in a somewhat different form on the nosewheel gear-equipped, late WW II era American Budd RB-1 Conestoga twin-engined cargo aircraft. Postwar Europe also served to play a major role in the development of the modern air cargo and air freight industry. It is during the Berlin Airlift at the height of the Cold War, when a massive mobilization of aircraft was undertaken by the West to supply West Berlin with food and supplies, in a virtual around the clock air bridge, after the Soviet Union closed and blockaded Berlin's land links to the west. To rapidly supply the needed numbers of aircraft, many older types, especially the Douglas C-47 Skytrain, were pressed into service. In operation it was found that it took as long or longer to unload these older designs as the much larger tricycle landing gear Douglas C-54 Skymaster which was easier to move about in when landed. The C-47s were quickly removed from service, and from then on flat-decks were a requirement of all new cargo designs. In the years following the war era a number of new custom-built cargo aircraft were introduced, often including some "experimental" features. For instance, the US's C-82 Packet featured a removable cargo area, while the C-123 Provider introduced the now-common upswept tail to allow for a much larger rear loading ramp. But it was the introduction of the turboprop that allowed the class to mature, and even one of its earliest examples, the C-130 Hercules, is still the yardstick against which newer military transport aircraft designs are measured. Although larger, smaller and faster designs have been proposed for many years, the C-130 continues to improve at a rate that keeps it in production. "Strategic" cargo aircraft became an important class of their own starting with the Lockheed C-5 Galaxy in the 1960s and a number of similar Soviet designs from the 70s and 80s, and culminating in the Antonov An-225, the world's largest aircraft. These designs offer the ability to carry the heaviest loads, even main battle tanks, at global ranges. The Boeing 747 was originally designed to the same specification as the C-5, but later modified as a design that could be offered as either passenger or all-freight versions. The "bump" on the top of the fuselage allows the crew area to be clear of the cargo containers sliding out of the front in the event of an accident. When the Airbus A380 was announced, the maker originally accepted orders for the freighter version A380F, offering the second largest payload capacity of any cargo aircraft, exceeded only by the An-225. An aerospace consultant has estimated that the A380F would have 7% better payload and better range than the 747-8F, but also higher trip costs. As of September 2016, Airbus had received 319 firm orders and delivered 195 aircraft; Emirates is the biggest A380 customer with 142 ordered of which 83 have been delivered. Thai Airways International, British Airways, Qantas, Asiana Airlines, Qatar Airways, Etihad Airways and Air France are other operators. Nearly all commercial cargo aircraft presently in the fleet are derivatives or transformations of passenger aircraft. However, there are three other methods to the development of cargo aircraft. Existing air cargo derivatives of passenger airplanes have been very fitting. For example, the Boeing-747-200F has proven to be the big payload toiler of the air cargo fleet and could continue unmodified for a number of years. Each derivative freighter has the benefit of having most of its development costs already assessed against the transaction of its passenger equivalent. Furthermore, the financial arrangements for buying the airplane have already been established and there is a quite short lead time before production (as compared to all new aircraft). A main drawback of existing air cargo aircraft is that they represent older technology; thus their direct operating costs are higher than what might be achieved with current technology. Additionally, since they generally have not been designed specifically for air cargo, loading and unloading can cause problems; the aircraft may be pressurized more than necessary, and there may be apparatus manufactured for passenger safety that is not necessary for cargo. A dedicated commercial air freighter is an airplane which has been designed from the beginning as a freighter, with no restrictions caused by either passenger or military requirements. Over the years, there has been a dispute concerning the cost effectiveness of such an airplane, with some cargo carriers stating that they could consistently earn a profit if they had such an aircraft. To help resolve this disagreement, the National Aeronautics and Space Administration (NASA) selected two contractors, Douglas Aircraft Co. and Lockheed-Georgia Co., to independently evaluate the possibility of producing such a freighter by 1990. This was done as part of the Cargo/Logistics Airlift Systems Study (CLASS). At comparable payloads, dedicated cargo aircraft was said to provide a 20 percent reduction in trip cost and a 15 percent decrease in aircraft price compared to other cargo aircraft. These findings, however, are extremely sensitive to assumptions about fuel and labor costs and, most particularly, to growth in demand for air cargo services. Further, it ignores the competitive situation brought about by the lower capital costs of future derivative air cargo aircraft. The main advantage of the dedicated air freighter is that it can be designed specifically for air freight demand, providing the type of loading and unloading, flooring, fuselage configuration, and pressurization which are optimized for its mission. Moreover, it can make full use of NASA’s ACEE results, with the potential of significantly lowering operating costs and fuel usage. Such a high overhead raises the price of the airplane and its direct operating cost (because of depreciation and insurance costs) and increases the financial risks to investors, especially since it would be competing with derivatives which have much smaller development costs per unit and which themselves have incorporated some of the cost-reducing technology. One benefit of a combined development is that the development costs would be shared by the civil and military sectors, and the number of airplanes required by the military could be decreased by the number of civil reserve airplanes purchased by air carriers and available to the military in case of emergency. There are some possible drawbacks, as the restrictions executed by joint development, the punishments that would be suffered by both civil and military airplanes, and the difficulty in discovering an organizational structure that authorizes their compromise. Some features appropriate to a military aircraft would have to be rejected, because they are not suitable for a civil freighter. Moreover, each airplane would have to carry some weight which it would not carry if it were independently designed. This additional weight lessens the payload and the profitability of the commercial version. This could either be compensated by a transfer payment at acquisition, or an operating penalty compensation payment. Most important, it is not clear that there will be an adequate market for the civil version or that it will be cost competitive with derivatives of passenger aircraft. Most conversions are carried out on older aircraft no longer suitable for passenger use, often due to changing safety or noise requirements, or when the aircraft type is considered to have become uncompetitive in passenger airline service, but there is also a market for new-build freighter designs. 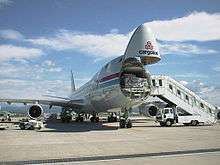 Freighter aircraft normally have strengthened cabin floors and the inclusion of a broad top-hinged door on the port fuselage in addition to an absence of passenger cabin windows which are "plugged." 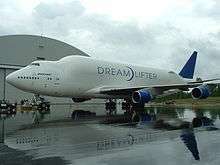 The Boeing 747 can be ordered in a freighter version with a large nose door which can be raised above the cockpit for loading. The bulged top deck housing the cockpit was originally designed to allow an unobstructed main deck, and to keep cargo from crushing the pilots in the case of an accident. The interior size of the fuselage is matched to the size of a standard shipping container, stacked two high and two wide. Other types of specialized civilian cargo aircraft configurations, include the swing-tail Canadair CL-44 and Boeing 747 Large Cargo Freighter, and the clamshell tail CASA CN-235. Important "airlift and logistics;" "cargo-liners," "mail-liners," and "mail aircraft." ↑ Andrews and Morgan 1988, pp. 158–159. ↑ Kay, Anthony (2004). Junkers Aircraft and Engines 1913-1945. London: Putnam Aeronautical Books. ISBN 0-85177-985-9. ↑ "A380 Freighter Specifications". Airbus. Archived from the original on 30 June 2010. Retrieved 18 April 2010. ↑ Andriulaitis, Robert. "B747-8F VS A380F" InterVISTAS, December 2005. Retrieved: 29 September 2012. 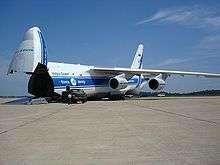 Wikimedia Commons has media related to Cargo aircraft.